Description: A Victorian kitchen setup with many different cabinets, an island and overhang unit. Design: Based on Osterfield Cambridge series. 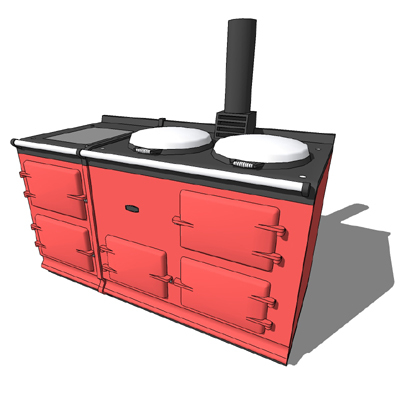 This model is optimized for the Aga 4 oven by Allister Godfrey. The oven model is not inlcuded but can be downloaded from: this location. If you wish to use a smaller type of oven just Push/Pull the sides of the oven area to fit the smaller type. Notes: Due to the heavy detail in this kind of kitchen style the polycount can slow down performance. It's recommended to turn off shadows in SketchUp when using this model. Nov 25, '05: Fixed doorknobs on left cabinet.